STOPCRUSH.ORG and AELLA are sponsoring Angel Hanz for the Homeless with a wonderful meal!!! YOU DON'T WANT TO MISS CHRISTIAN SANCHEZ OUR SPECIAL GUEST FOR THE MONTH of JANUARY 29, 2017 Gathering. 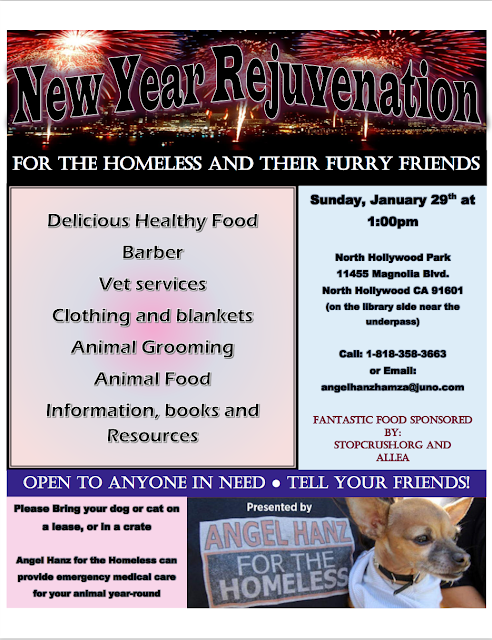 by mail: ANGEL HANZ FOR THE HOMELESS, INC.
Angel Hanz also takes the Homeless to her Dentist for Dental Care!